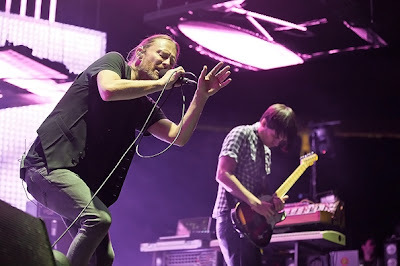 Radiohead played Chicago on June 10th at Tinley Park and performed new song "Full Stop" for the first time ever. This is the 3rd new song that Radiohead have debuted on their 2012 tour so far (Identikit, Cut A Hole, and now Full Stop). The one thing you can always count on from a Radiohead show is that their crazy/obsessed fans will get footage online ASAP, and that is what has happened with "Full Stop". Check out the two different cuts of the song from two different fans below. "Full Stop" comes with a lot energy and is a great new addition to the Radiohead catalog. Also keep your eyes open for some sort of a collaboration with Jack White in the near future as they were seen together at Bonnaroo.